It’s a good idea to have a clone of your entire website to be able to test as much possible on your WordPress site before doing any real changes at all on your production site. WP Staging allows you to create a site for testing purposes and allows you to copy that staging site to liv to migrate the data on your production site. Even better, it also allows you to create a clone of an already existing staging site and allows you to copy this cloned site to the parent clone. This is very helpful if you want to test the entire processing from cloning to pushing to make sure that you do not experience any errors in that process chain before you repeat the steps on your production website. 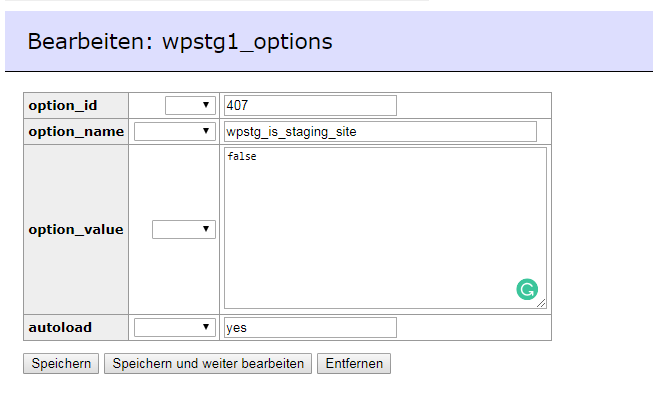 Even though you can do that with WP Staging Pro very easily it needs a little modification in the database table wpstgX_options of the staging site. This new site will be a clone of the original cloned site A. As always, please make a full database backup before you are going that route.